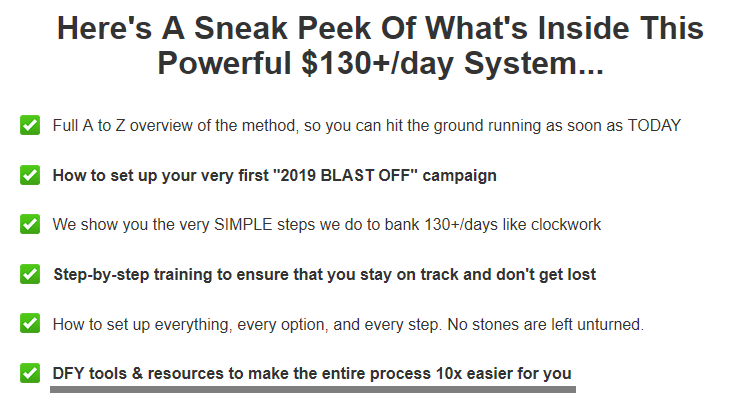 I came across a program called 2019 Blast Off that claims it can provide people the opportunity to earn an easy $130 per day using a so-called revolutionary system created by Bill Hugnall and Simple Spencer. According to the creators, this program is created with beginners in mind so their system is supposedly easy to use and can produce significant results. If you came across their site then chances, you’ve also seen their sales video including the many claims on their sales page. These claims may have caught your attention, but you also want to know first if they can really deliver the results that you are looking for. 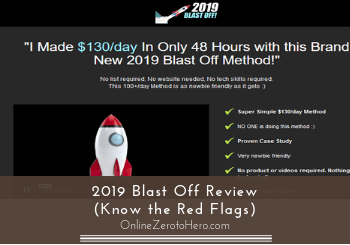 Well, you came to the right place because I will share with you in this 2019 Blast Off review all the info I got about this program. 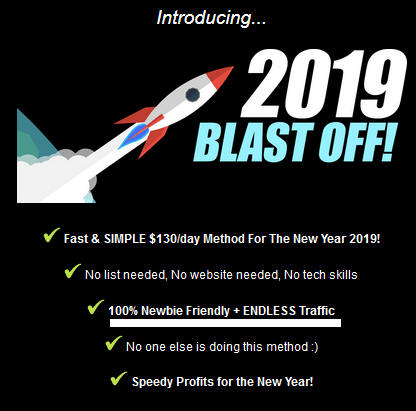 2019 Blast Off is a program that claims it can provide people the opportunity to earn an easy $130 per day using a so-called revolutionary system created by Bill Hugnall and Simple Spencer. According to the creators of this program, you’ll be using solo ads which is a type of business tactic that will revolve around email marketing. However, this program recommends that you buy an email list from business owners that you will use on your campaign, which in my opinion, is a bit unethical. It could even lead you to a precarious situation and trouble from unwarranted email spamming if you do not know what you are doing, and you don’t want that to happen to you especially if you’re still new to online marketing. That is why I don’t recommend this program because it contains several red flags that make it a risky investment, in my opinion. I would suggest that you find other legit opportunities online that can truly give you the results you’re looking for. What is 2019 Blast Off and what does it offer? 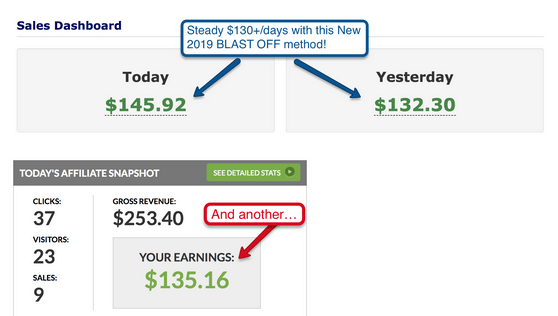 When I first visited their sales page and saw the claim that it’s easy to earn $130 per day using a secret system, I became a bit skeptical and would like to do my own research so I can uncover any discrepancy from their site. 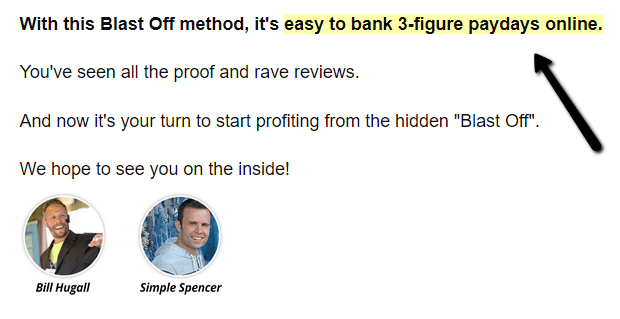 They claim that it’s easy to bank 3-figure income online. The first thing that they want to highlight on their sales page is that their system is beginner-friendly, and you don’t need any technical skills to make money online. Also, you only need 30 minutes each day to set up your campaigns using their secret system and wait till the money flows into your account. Their sales video doesn’t give any in-depth info of how their system works, but you will be bombarded with various income claims and positive results that are supposedly waiting for you once you purchase their program. Based on my research, I found out that once you purchased the program, you will be given access to 6 training videos about using solo ads to make money online. The training videos will show you how to use the Leadpages landing page builder and Aweber autoresponder in your campaign, but according to the creator, it will be based on their secret system. They also claim that their secret untapped method will surely bring surefire results and easy $100+ per day with just minimal effort on your end, which in my opinion, is a bit unrealistic. The prospect of earning $130 a day without doing anything significant is very attractive to some people. But that is NOT the case in real life because you need to invest time, effort and a bit of patience to succeed in online marketing. No matter how good their claims are on the sales page, there are no secret systems or shortcuts that can help you create a decent income online overnight and without any effort; it just doesn’t work that way. This is the reason why I wrote this review, so I can share some of the red flags I’ve uncovered from their sales page and for you to make an informed decision about this program. According to the creator of this program, you’ll be using solo ads which is a type of business tactic that will revolve around email marketing. If you’re still new to solo ads, it is a type of tactic where you buy an email list from other online business owners and use that list to promote your product. An essential element of this tactic is the number of contacts on your list because the more people you send your solo ads to, the better your chances of making a sale. In my opinion, buying an existing list from other business owners is tricky and may put you in a precarious situation, if you do not know what you are doing. Always take into consideration the privacy laws that are now being enforced by authorities and the penalties as well as the civil case that comes with it. If you are charged with spamming, it could cost you thousands of dollars in fines, and that is a harrowing experience especially if you’re still starting out in online marketing. That’s why you should consider this red flag before you buy this program. However, solo ads can be used to make money online, and some people do this successfully. But there are also people wasting a lot of money on it. So at least you need to be aware that it will not just magically make you money. It is in most cases, in my opinion, definitely not the best approach for beginners to use solo ads. And if you decide to do it, you would need quite a lot of training about it to get any results out of it and to make sure you do it legally and ethically. Based on their sales page, you just need 30 minutes per day to start getting insane profits, and you don’t need any technical skills to accomplish that task. So, this means that this program is what every beginner needs when he or she wants to easily make money online. According to their sales page, this program is supposedly newbie-friendly. In reality, this is not the case – especially if you want to succeed in email marketing because you need some time to learn more about how you can build your own email list and how you’re to use that list in your campaigns. You cannot do that in 30 minutes, so this program is not really beginner-friendly, because it gives you the impression that making money online can be achieved easily through a secret system. In my opinion, they want you to believe that there’s a new and revolutionary method of doing email marketing, but the truth is there is none and solo ads has been used for years by online marketers. It’s not something new and like what I’ve said before, buying an existing list from business owners, which is common in solo ads, is not a new method but can be a risky way of doing email marketing. I urge you to take this red flag seriously before you make your final decision. The initial cost for this program is $7.99 but it’s just an entrance fee to their membership page, and you will see the upsells or OTO’s (one time offer) once you’re in the inside. This program may have a relatively low price, but I can safely say that it will have upsells even though its creator did not fully explain it on the sales video. But they referenced the upsells on their sales page saying that there will be tools and resources that will make the entire process easier.